When I posted about how to save money on Toilet Paper, I promised to talk a bit about strategies to use when taking advantage of what I call “Manufacturer” Deals. These are sales that require one to buy a certain dollar amount or a certain number of product to receive some form of money back. I specifically wanted to explain what I feel is a very counter intuitive, but simple, strategy that is used by couponers to get the most out of these deals. The same simple strategy works on all the manufacture deals, in all their varieties, but you’ll want to scroll to the bottom for additional information. Buy so that your total before coupons is as close to the offer’s requirement as possible and use multiple coupons to lower the price you actually pay at the check out. Watch for high dollar coupons on low-priced products to help boost your amount to the requirement without actually spending very much. Take advantage of multiple offers, if possible. It’s simple, right? You’re wondering what is so counter intuitive? I’m telling you that this is one of those concepts that is so simple but that I see people make “mistakes” on all the time. It’s kind of like “buy low, sell high” in the stock market. Obviously, the better offer is to buy $30.00 worth of products and get $10.00 back, a savings of 33% rather than the $20.00, get $5.00 back, a savings of only 25%. But notice: Charmin is $9.99. Three rolls is $29.97, not $30.00! Buy four packages of Charmin at $9.99, use one coupons for 25 cents they’ve pulled from their paper. Total is $39.96, minus 25 cents for the coupon plus $10.00 back. That’s four packages for $29.71. Each package is $7.43. There are 20 double rolls in each package, so each of these double rolls is 37 cents. My target price is about 30 cents for a double roll so this price doesn’t make the cut for me. Remember the strategy! Get close to the offer amount and use multiple coupons. Watch for other products that help to boost your amount to the requirement. Sign up for CVS offers under their Extra Care card – you will regularly get coupons emailed to you (or get them printed out on your receipt or from their coupon machine.) Many of these coupons are for $ off of a certain amount of $’s spent – usually $5.00 to $10.00 off of a spend amount of $15.00 – $40.00. Use one of these coupons on your TP to lower the cost even more on the above deal. The toilet paper then, with the commonly issued CVS coupon of $5.00 back if you spend $30.00 coupon from CVS looks like the above: I’ve spent $30.96, minus the five dollar coupon, a dollar for the coupons and $10.00 back. Three packages and the Dawn for a total of $14.96. The Charmin comes out to $4.73 a package, almost half price. That’s 24 cents a roll. Now, I’m happy. Of course, I’d be even happier if the rebate for $10.00 off $30.00 from P & G was available in my area, and would have only spent $4.96 total – and sometimes they are available. That’s why one needs a coupon matching site. I know this Charmin example is not particularly a particularly dramatic one, but it is a savings, and so often savings is about saving a bit here and a bit there. If I were able to buy equal amounts, say 80 rolls (four packages) full price at Amazon would be $83.48, CVS would be $55.26, the first scenario, I’d pay $29.96 and under the second scenario, I’d pay $25.28, and the “Wait there’s more” scenario: $18.92. 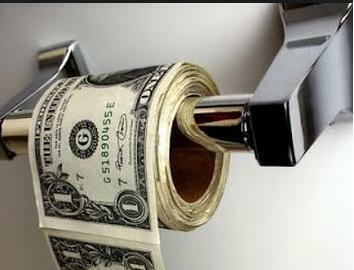 If I were lucky and there was a rebate running, I’d buy the same amount of toilet paper for pennies. You choose what you pay with a bit of diligence and the right offers. These small savings add up over the course of the year, especially when multiplied over many products lines. That’s just all too much to think about! Then don’t: just go to a coupon matching site and they’ll tell when the deal is coming up, and most likely tell you a “scenario” of what to buy to get the best deal. Let’s look at a P & G manufacturer offer for our second example, their current offer, “The Road to Glory.” First of all, I have no stores that I shop at in my area that are participating, something that’s never happened before (you can bet I’ll be calling or emailing Rainbow and Cub to find out why!) I’ll have to use a coupon matching site that’s unfamiliar to me from another area of the country so you can see how the deals are worked. This particular offer requires you to buy everything at once from one participating store, although there many offers that will let you buy from anywhere and/or over a period of time. See this advertised in their store ad in a box with a few items. They’ll buy $30.00 worth of things they think they’ll use in the near future and send in for the rebate by email or snail mail. 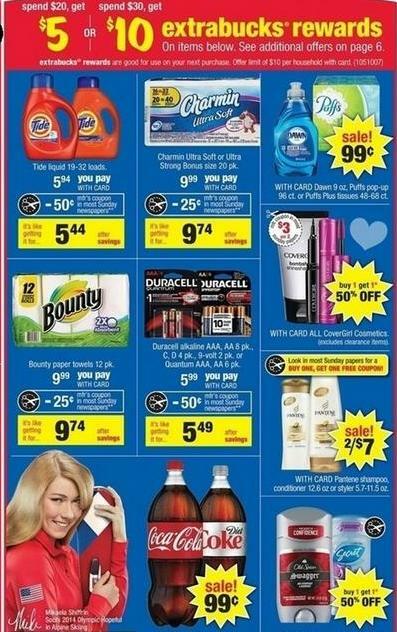 They will save $10.00 with the rebate and a bit more if any of the items are actually on sale. Remember your strategy here – buy products using coupons! Take advantage of multiple offers. Leverage this rebate with the sales offer from your store, manufacturer’s coupons, and “store” coupons from the store’s ads or coupon books. Buy for the best pricing (most of these products don’t expire or have extremely long expiration dates) and not necessarily for items you need immediately. 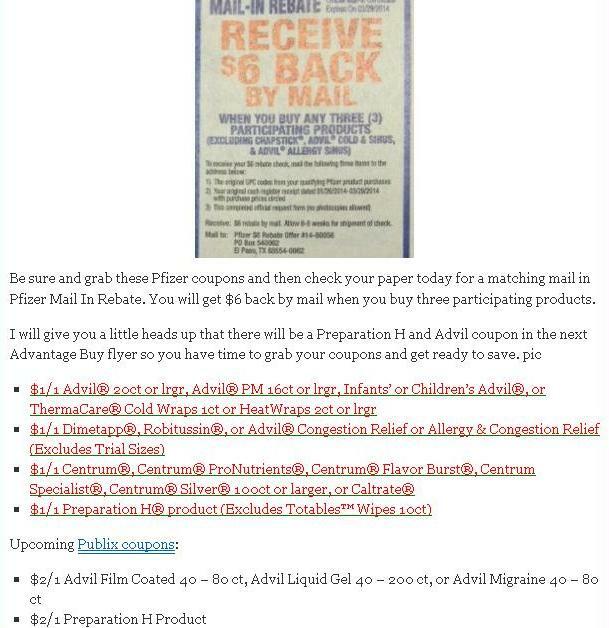 Find the rebate offer online, read the conditions, products, etc. This offer allows you to enter in a zip code to find participating stores. Check the coupon matching sites for that store – almost every store has an enthusiastic person or group who run sites like this and will list the products with prices and the coupons available. The coupons may be from the paper, printable, or transferable to your phone or store card. Check their best deal scenarios or figure out your own. What’s the difference in Pricing? 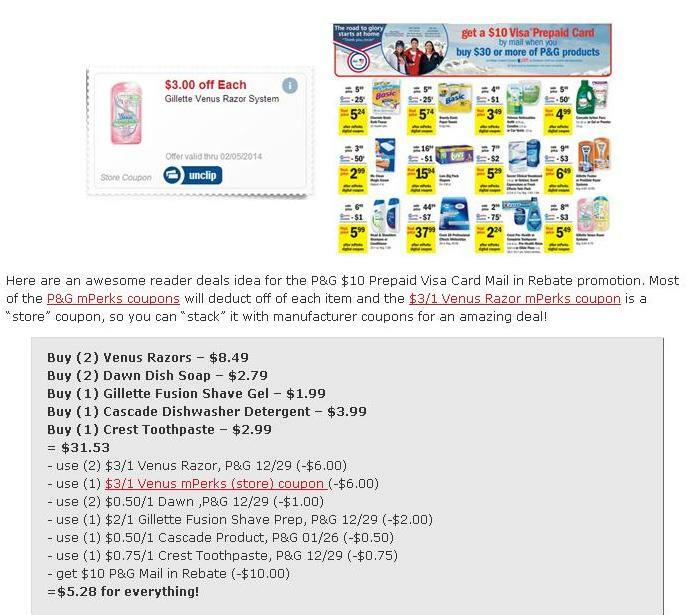 Meijars Madness, a coupon site devoted to that store has worked out a scenario getting multiple products for around $5.00 on this P&G Offer. Notice it gives a deal and tells what coupons to use, including a clickable store coupon that stacks with the manufacturer’s coupons. 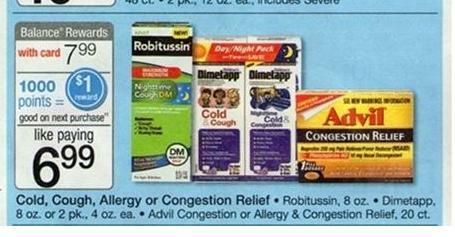 Here’s an ad from Walgreens, showing several different cold products for sale. Doesn’t look like that great of a deal? Scroll down and see. Frankly, most probably wait until they are sick and then look for whatever is on sale, or they maybe even just ask someone to pick up their favorite brand and pay full price on it. Remember the strategy – although there is no $ amount that needs to be met, the scenario below uses multiple coupons and offers. If you’re brand loyal, fine, but look for sales before you need the product! If not, keep your eye out for really good opportunities to combine sales, money back in store credits, coupons and rebates! 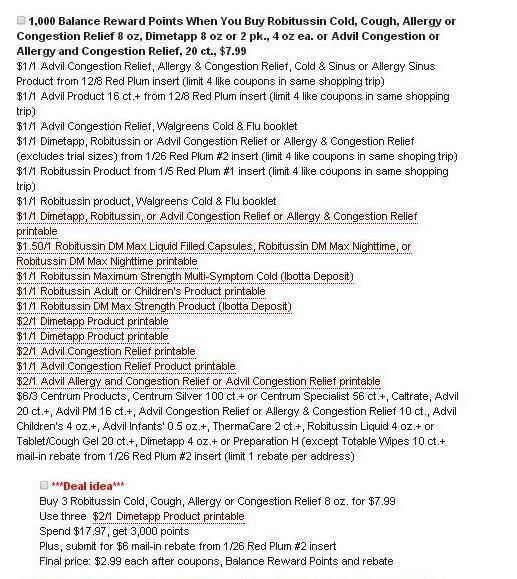 Robitussin is normally $10.99 (online price) so the difference is $32.97 – $8.97 for a total savings of $24.00. It has a long expiration date and should be fine in your cupboard for a long time. Catalinas are little slips of paper that print off with your receipt and generated by buying certain products or combinations of products. Although not officially Catalinas, sometimes the same type of offers are printed on the bottom of your receipt. It is always worthwhile to look at these. Generally, they expire and can be used for money off your next visit, with some limitations. Now and then they may be for a free product. These are often not advertised, and if not, the only way to find out about them is to either accidentally buy something that triggers the Catalina (or a notice of the upcoming Catalina) to print or to read about them on a Coupon Matching site. Buy their products, blissfully unaware that they are missing opportunities and then don’t look at the papers that come with the receipt. Remember your strategy: Combine coupons with Catalinas to reduce the cost to you. Check your coupon matching site and store ads for Catalina offers, buy the appropriate amount/kind of products and use coupons on them, if available. Always look at your receipt and any paper work that spits out. I often get products for a very low cost or for free. Here’s an example from Pocket Your Dollars of an unadvertised Catalina combined with an in store coupon. Now, I’m not judging here, but I would never buy these bars, so remember this is just an example. I do use a catatlina strategy like this often when buying vanilla – McCormicks puts one out once or twice a year. Guys, this is 2014 – while most of us are aware of offers that come by now and then that require one to save UPCs and send them in, most free product offers are much easier. Peelies/hangtags: often found on one product with instructions on how to get another product for free or lesser cost; a hangtag on pasta might say buy two pastas, get a dollar off olive oil. A peelie on taco shells might say buy two, get a pound of hamburger for free. Strategy: Be aware of these before you go into the store so you can have the right coupons to use! While most stores won’t let you use an additional coupon on the “free” product, you can use them on the products you are paying for. Your coupon matching sites will be aware of these. Clubs: One signs up on a site for a card or a “membership” and when one buys so much product, they get something for free or something back. Two examples: L’Oreal has a Gold Reward club for their Preference Hair Dye – enter in UPC codes online and every time you buy five a coupon is sent out for a free box; CVS has a beauty club that gives $5.00 back for every $50.00 spent. Leverage these by buying sale priced products with coupons! Who has time to track down deals? Take advantage of the legwork that a coupon matching site does…it’s like having your own personal shopper whispering in your ear. They’ll tell you what offers are on the table, what to buy and when/where to buy it. I can guarantee you that no matter how long you’ve been shopping, they will find offers and deals that you would have otherwise missed. The key to recognizing these offers is the “money” back. It doesn’t matter if the “deal” is offered by the store or the manufacturer, if it is for a single product, brand, or a grouping of disparate items, all of these offer something back to the consumer. It also doesn’t matter what is offered back, the key to recognizing these deals is that something is going to be coming back to you that can be spent like money or is “free” to you. There will be restrictions and dead lines, so you will need to be aware of them. Catalinas: a slip of paper that prints with your receipt (and sometimes printed instead on the receipt itself) allowing $ off on a future visit to the store) They are only accepted, generally, at the same store and have an expiration date, but can be used on any product, even though it may have the manufacturer’s brand on the top – they spend like money but cannot buy certain things. Store rebates: which are things like Extrabucks from CVS or Register Rewards from Walgreens, which are used like money at the store later. Generally, there are some restrictions on what they can be spent on, and at Walgreens if a Register Reward is used t pay for a product which will normally generate another Register Reward, a new Register Reward won’t generate. Store Gift Cards: Generally these are offered if you buy a certain number of products. Although it might not say so, these are almost always manufacturer groupings. I see this mostly at Target. Product: There are many types of offers stores and manufacturers may make to consumers that will generate “free” products, sometimes related to the manufacturer and sometimes not. Generally, the same strategy applies for these smaller offerings, but one needs to be very aware any restrictions and deadlines. I use my coupon matching site to make me aware of these offers. Know the offer: Read the fine print and follow the instructions and deadlines. Buy: You’ll need to buy the “right” products! Make sure you have the right sizes and types to use/generate the offer. Often it is the buying of the product that generates the form one needs, which will print out for you at a check out. Make sure these print out properly and your clerk gives it to you. Go to customer service is something goes awry and explain nicely what happened. Follow up: Do the legwork. Save or cut out UPC symbols if required. Keep your receipts. Restrictions/deadlines: Manufacturers know that offers generate sales because consumers love a great deal. If you miss the deadlines, you’ve just bought product and given the manufacturer a deal! Store Policy: Your store may have restrictions on the number of same coupons used or types of coupons. They may not have enough product and some will allow you to call ahead and reserve. One will almost ALWAYS need multiple coupons to take best advantage of these types of deals. Papers are cheap, and generally one or two coupons used “pay” for the price of the paper. Look at the Sunday Coupon Preview on Thursdays to see what is coming out in your paper. Buy multiple papers if there are coupons you want. Ask friends/relatives/coworkers to give you inserts. Pick up inserts in places where the public reads the paper; libraries, coffee shops, etc. Extreme couponers dumpster dive, steal papers, go through the neighbor’s garbage – NOT recommended! Order coupons – this is especially cost-effective if you look ahead at I heart CVS or I heart Wags for upcoming sales. Check your Coupon Matching sites! They will list what paper coupons to use and give links for coupons to print or load to your phone or store card. Don’t use coupons or don’t have any? This simple shift in the way you think about how you take advantage of these deals will still save you some money with basically no effort on your part. I wanted to comment a bit more on the strategy: Buy so that your total before coupons is as close to the offer’s requirement as possible and use multiple coupons to lower the price you actually pay at the check out. Watch for high dollar coupons on low-priced products to help boost your amount to the requirement without actually spending very much. Take advantage of multiple offers, if possible. I’ll illustrate with CVS and their offers for Extra Care Bucks (ECBS) which work just like these Manufacturer Deals. CVS often gives coupons for $ off if you buy $ worth of products. Let’s say you have a $10.00 off coupon if you buy $30.00 worth of product. Here’s an example of applying the strategy: You wish to buy L’Oreal Hair Dye, on sale it is six dollars and if you buy three you get $5.00 off. You have three coupons for $1.00 off. Your hair dye will be $18.00, minus $5.00, minus $3.00, for a total of $8.00. You’re not getting to $30.00 mark so you can’t use the ECB offer. Because you want your hair dye for free, you look around for other products that fit the strategy. If you buy a bottle of Dulcolax for $12.99, there is a rebate, which makes this product free. Even better there is a $3.00 off coupon, so you’re spending $9.99 on it. Now you’re up to $30.99 for a total at the cash register, you use $6.00 in coupons, get the $5.00 off, and pay $19.99, plus $1.39 tax. You send in for the rebate (49 cents) so your out of pocket totals $21.87. You get a $10.00 ECB from CVS and a $12.99 check from Dulcolax, and your hair dye is free and you’re ahead by about a buck. The point here is that you didn’t really need the Dulcolax, but hopefully can donate it or give it to someone who does. It was merely a means to apply the strategy and boost your spending amount to the $30.00 mark so you could get the $10.00 back from CVS and not have to pay for the hair dye. This is an essentially easy subject, but one with a lot of variables to keep track of and remember! What can you add that I’ve missed? This entry was posted in Click here for Fabulous Food Posts, Frugal Helps and tagged couponing. Bookmark the permalink. There is another option for toilet paper, and that is by using washable ‘family wipes’. Some people make these with old flannelette bed sheets, cut into squares. Using disposable TP for the ‘heavier jobs’ and when you have guests. They throw the cloths in with their regular laundry. The container for the used wipes has a cover, and doesn’t get smelly because it is emptied frequently. I really don’t see much of a difference between reusable TP and reusable cloth diaprs – and I think your compromise of using disposable TP is a Very Very good one! Do you have any issues with your cloths getting flushed by accident? I’m pretty sure that would be very likely to happen at my house! By the way, I thought about you when I was at my daughter’s house…we made Cabbage Rolls and I told her about your hint for freezing the cabbage, first. We bought the cabbage the same day we made it, so I didn’t have a chance to try it out for myself, though! I’m glad to see you’re still stopping by now and then! Hope you’re in the warm, sunny part of the world…it has been darned cold here in MN. My family doesn’t use the family wipes, but there are even websites where you can buy them (google search). I would have no problem using them, and maybe sometime in the future we will. When I had my babies, I also used cloth, and only disposable when outside the home. Loved them, and it saved us a fortune, as we had 2 babies in diapers for 18 months. We are currently in Australia, and return back to Canada in May. Enjoy summer, all year round.This has certainly been the winter for storms, as Nova Scotia, is having lots of them too. It does sound like you’re living the best of both worlds! When my kids were babies, we didn’t have the marvelous fitted, super absorbent cloth diapers of today with the velcro tabs and the waterproofing built in. My daughter also has a gadget that fits in her toilet tank and has a squirt hose so she can rinse solids right into the toilet bowl! Genius! Removing the solids from the old fashioned diapers and the leakage was the worst, and with today’s technology, that’s all eliminated…*smirk. * My grandma used to say, “What will they think of next?” and I find myself wondering that all the time! But back to TP – I watched the show “Extreme Cheapskates” (thought I would pick up some tips) and realized that even though I thought I was cheap I have nothing on these folks! Some of their ideas were very inventive, for sure. I wish the show would have focused on the many great ideas these people could have shared and not just focused on the things they thought would *shock* the American public. One woman didn’t use TP at all, but kept a squirt bottle on the sink and rinsed herself (which I thought is actually much cleaner than the typical bathroom habits.) What blew me away about her was that when she used a paper towel from a public restroom, she brought it home, washed it by hand and hung it to dry. She reused these many, many times to dry herself off. Another did use cloth wipes, with a container for each. I don’t remember if she put them in a solution, but she used little trash cans with lids. I do have to say that one new product I haven’t tried, and probably never will are the disposable wipes they have for families. I can see how they’d be convenient with young children or if someone had a health issue like incontinence, but for the general population it seems to kind of wasteful and a plumber told me even if they are disposable they cause problems, and they are blamed for all kinds of issues in public sewers. They are also being blamed for health issues like rashes and yeast infections!